Superior vena cava (SVC) cancerous thrombosis is extremely sparse, especially in the setting of extrathoracic tumours. Herein, we present the case of a patient with a squamous cell carcinoma of the tongue, who presented with SVC syndrome possibly secondary to symptomatic metastatic pericardial effusion. In this unique patient, the disastrous concurrence of all the elements of Virchow's triad within the confined anatomical space of SVC may have precipitated extensive vessel thrombosis with catastrophic consequences. 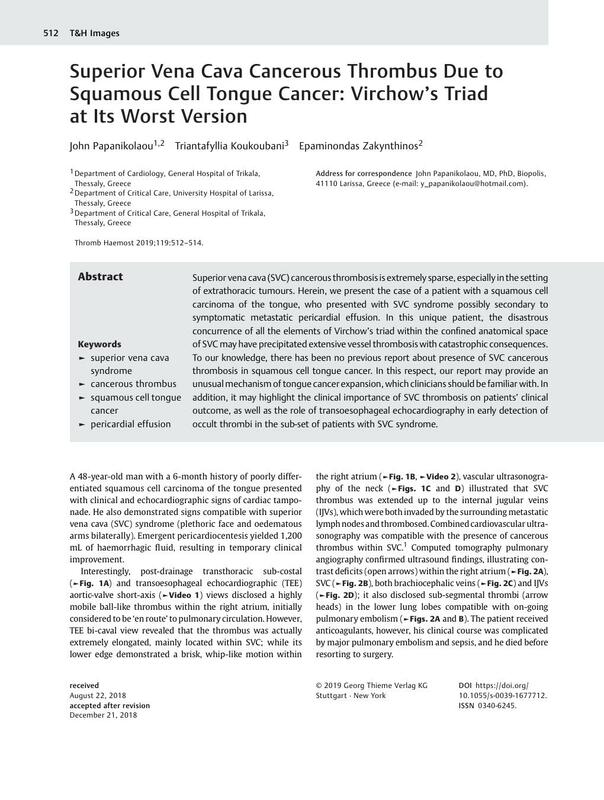 To our knowledge, there has been no previous report about presence of SVC cancerous thrombosis in squamous cell tongue cancer. In this respect, our report may provide an unusual mechanism of tongue cancer expansion, which clinicians should be familiar with. In addition, it may highlight the clinical importance of SVC thrombosis on patients' clinical outcome, as well as the role of transoesophageal echocardiography in early detection of occult thrombi in the sub-set of patients with SVC syndrome. J.P. and E.Z. conceived the study. J.P., T.F. and E.Z. participated in the acquisition and interpretation of data, drafted and critically revised the manuscript for important intellectual content. All authors read and approved the final manuscript.